This is the second of a two-part series in NWABR's bioinformatics curriculum, funded by a grant called Bio-ITEST: New Frontiers in Bioinformatics and Computational Biology, an Innovative Technology Experiences for Students and Teachers (ITEST) award from the National Science Foundation(NSF). This three-year award provided funding for education outreach programs and curriculum development that help secondary school teachers and their students learn about how information technology is used in biological research. This curriculum unit explores how bioinformatics is used to perform genetic research. 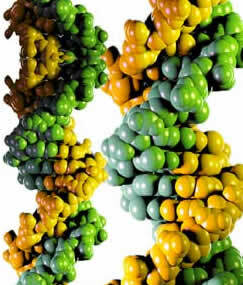 Specifically, the bioinformatics tools of BLAST, ORFinder, ClustalW and Cn3D are used to analyze genetic sequences. The cytochrome c oxidase subunit 1 (COI) gene is introduced as the “DNA barcoding” gene that allows for identification of animal species. Students examine DNA sequences from different animal species, investigate the relationship between protein structure and function, and explore evolutionary relationships among eukaryotic organisms. The unit concludes with an authentic student research project, sequencing the COI genes from samples obtained through a partnership with the Seattle Aquarium in Seattle, Washington, or samples they collect themselves in the community. Throughout the unit, students are presented with a number of career options in which the tools of bioinformatics are developed or used. The career lesson near the end of the unit culminates with resume and cover letter writing activities and a mock job interview. Download the full Unit Overview (PDF). This contains authors and contributors, lesson summaries, instructional requirements, and lesson correlations to National Science Standards and the Next Generation Science Standards. In order for us to measure how our curriculum resources are being used, please take a moment to contact us and let us know the class or classes in which you're using our lessons. We also welcome feedback about our advanced bioinformatics curriculum. We will not share your contact information with anyone. Major collaborators include Digital World Biology, EdLab Group, and Shoreline Community College. The program also draws on NWABR’s strong relationships with school districts, community groups, bioethicists and NWABR member research institutions. This curriculum unit explores how bioinformatics is used to perform genetic research. Specifically, the bioinformatics tools BLAST, ORFinder, ClustalW2/JalView, and Cn3D are used to analyze genetic sequences and molecular structures. The cytochrome c oxidase subunit 1 (COI) gene is introduced as the “DNA barcoding” gene that allows for identification of animal species. Students examine DNA sequences from different animal species, investigate the relationship between protein structure and function, and explore evolutionary relationships among eukaryotic organisms. The unit concludes with an optional authentic student research project, sequencing the COI genes from samples they collect themselves or samples obtained through partnerships with the National Oceanographic and Atmospheric Association (NOAA) and the Seattle Aquarium, both based in Seattle. Throughout the unit, students are exposed to a number of career options where bioinformatics tools are either developed or used. The career lesson near the end of the unit culminates with resume and cover letter writing activities and a mock job interview. In this lesson, students are introduced to the process of genetic research. The lesson begins with a Think-Pair-Share activity designed to introduce students to the types of research questions people in different career fields might answer using bioinformatics tools. After a short background explanation provided by the teacher about how genetic research is done, students make their own hypotheses and predictions about the relatedness of canine species, and align paper DNA sequences to evaluate their hypotheses. The lesson concludes with a group activity introducing students to pairwise comparisons of DNA sequences, which will be explored more fully in later lessons. In Lesson One, students learn how DNA sequencing core lab managers might use bioinformatics tools in their career. In this lesson, students learn how to use bioinformatics tools to analyze DNA sequence data and draw conclusions about evolutionary relationships. Students collaborate with their group members by pooling their DNA sequences from Lesson Two: DNA Barcoding and the Barcode of Life Database (BOLD) to perform and analyze multiple sequence alignments using the computer programs ClustalW2 and JalView. After comparing relatedness among and between the species within their group, students use their sequence alignment to generate a phylogenetic tree, which is a graphical representation of inferred evolutionary relationships. This tree is used to draw conclusions about their research question and hypothesis. In Lesson Three, students learn how microbiologists might use bioinformatics tools in their career. In this lesson, students perform a paper exercise designed to reinforce student understanding of the complementary nature of DNA and how that complementarity leads to six potential protein reading frames in any given DNA sequence. They also gain familiarity with the circular format codon table. Students then use the bioinformatics tool ORFinder to identify the reading frames in their DNA sequence from Lesson Two and Lesson Three, and to select the proper open reading frame to use in a multiple sequence alignment using their protein sequences. In Lesson Four, students learn how biological anthropologists might use bioinformatics tools in their career. Prior to this lesson, students learned how the cytochrome c oxidase subunit 1 (COI) gene is used to barcode animals. In this lesson, students learn more about the cytochrome c oxidase protein and its three-dimensional structure. In particular, students learn how to identify the active site in cytochrome c oxidase. Once they can find this site, they look at aligned structures (one of which contains a poison) and then determine the identity of a foreign substance that acts as a poison by binding to the active site. This lesson allows students to explore the use of the molecular visualization program Cn3D to learn more about cytochrome c oxidase, a ubiquitous and important protein. In Lesson Five, students learn how molecular diagnostics researchers might use bioinformatics tools in their career. In this lesson, students compile and synthesize what they have learned in the preceding lessons by writing a research report. The research report includes Introduction, Methods, Results, Discussion, andReferences sections. Emphasis is placed on relating previous lesson activities to the original research question and hypothesis. Extensions and lesson alternatives include instructions for creating a scientific poster, writing a scientific abstract, or writing a science-related magazine article. In Lesson Six, students learn how science and technical writers might use bioinformatics tools in their career. In this lesson, students learn about Leigh’s disease, a rare form of Subacute Necrotizing Encephalomyelopathy (SNEM) that can be caused by a deficiency in cytochrome c oxidase (complex IV). Deficiencies in the large, 13-subunit cytochrome c oxidase complex can result from defects in one of several proteins, including cytochrome c oxidase subunit 1, the protein encoded by the DNA barcoding gene, and examined in Lesson 5. Without the COI protein, cells are unable to harness usable energy from glucose. This is a jigsaw exercise. Students are assigned or choose one of four stakeholder parties. They meet in “like” interest groups to become more familiar with that stakeholder’s position and concerns. Afterwards, they meet in “mixed” groups with a representative from each of the stakeholder groups. Students identify areas of agreement and disagreement, and propose a compromise to recommend to Congress regarding funding for rare disease research. In Lesson Seven, students learn how pediatric neurologists might use bioinformatics tools in their career. In this lesson, students synthesize the information they have learned throughout the unit about people in various careers who use bioinformatics. Students then have the opportunity to perform independent research about a career of interest before developing a resume to use when applying for a bioinformatics-related job. Students also learn about writing cover letters. Optional extensions include peer-editing of resumes and a mock interview for a job related to a career of interest. DNA sequencing is performed by scientists in many different fields of biology. Many bioinformatics programs are used during the process of analyzing DNA sequences. In this lesson, students learn how to analyze DNA sequence data from chromatograms using the bioinformatics tools FinchTV and BLAST. Using data generated by students in class or data supplied by the Bio-ITEST project, students learn what DNA chromatogram files look like, learn about the significance of the four differently-colored peaks, learn about data quality, and learn how data from multiple samples are used in combination with quality values to identify and correct errors. Students use their edited data in BLAST searches at the NCBI and the Barcode of Life Database (BOLD) to identify and confirm the source of their original DNA. Students then use the bioinformatics resources at BOLD to place their data in a phylogenetic tree and see how phylogenetic trees can be used to support sample identification. Learning these techniques will provide students with the basic tools for inquiry-driven research. This Lesson Nine Student Handout is used for classes in which students are analyzing only one (not two) DNA chromatogram. In this lesson, students perform the wet lab experiments necessary for DNA barcoding. Beginning with a small tissue sample, students purify the DNA, perform the polymerase chain reaction (PCR) using COI-specific primer pools, and analyze their PCR products by agarose gel electrophoresis. PCR reactions that result in products of the correct size are purified and submitted for DNA sequencing. This DNA sequence data can be used in Lesson Nine, or as part of an independent project. PowerPoints to accompany each "Using Bioinformatics: Genetic Research" lesson are found on the "Lessons" page, beside each lesson title. See our Student Career Center for career profiles, planning resources, and more. DNA Barcoding Animation. New animation to accomany the advanced bioinformatics curriculum! When opening each file, you may need to click "Open With" and "Browse." Then select "Cn3D" from the program list. Be sure to download BOTH the "F" and "R" sequences for each sample. Open Chromatograms using Finch TV. "The Mitochondria" by BioVisions at Harvard University. Incredible animation that shows in detail the inner workings of the mitochondria. Click here for a complete list of biology-related animations (by topics) from MolecularMovies.org, "A Portal to Cell & Molecular Animation." Search for the protein structures and either print, view online, or download to view with an appropriate plug-in (some of which can be downloaded from the site). Features a "molecule of the month." Also, visit the extensive Educational Resources Section. NCBI's Structure Page allows you to view structures with a simple view, Cn3D, available for download from the site. It also maintains its own structure database, MMDB, which is a subset of the PDB. Offers many valuable resources for teaching and learning about biotechnology. Includes thirteen laboratory activities, curriculum units, and more. Topics include DNA extraction, fingerprinting, bacteria transformation, bioluminescence, plant micro propagation, a PCR activity, and a soybean flavor demonstration. NCBE Publications--Download curriculum to teach biotechnology in the classroom, including plant biotechnology and fermentation. Real life case studies illustrate how recent medical and technological advances arose from basic laboratory research. Some of the areas covered are Hepatitis B, polymers, designer seeds, and human gene testing. An extensive collection of science links is available at Dyanna's Picks. The downloadable resource list is especially valuable for Washington State educators. The National Center for Biotechnology Information has links to a wealth of resources for learning about biotechnology, including information on human genome resources, model organisms, and outreach/education. Begin at the "About NCBI" section for a good overview of resources. PubMed is a valuable resource for locating scientific research articles. This page provides information about biosciences in Washington State, as well as Education Materials such as a lab on gel electrophoresis and DNA fingerprinting. Biology4Kids: The Cell Biology Pages: These pages cover all major cell organelles in detail with gorgeous color graphics and helpful analogies for understanding cellular functions. Not just for "kids," this site would provide a terrific review for high school students as well. The Biology Project provides cell biology resources in addition to addressing other aspects of biology. It also offers activities, lesson plans, and tutorials. Cells Alive provides a wonderful microscopic images of cells. Check out the cell model tutorial and the cell gallery! NCBI Bookshelf: Search topics directly in the online versions of the classic texts of cell biology,Molecular Biology of the Cell, and Molecular Cell Biology. This is an amazing resource! Medline: Latest news on stem cell research from the National Library of Medicine. Science Magazine: Original article on "Embryonic Stem Cell Lines Derved From Human Blastocysts" in the October 1998 issue. Stem Cell Primer from the NIH provides an overview of stem cells and issues related to their growth. Virtual Cell, An Education Index Top Site. Zoom into the cell, cut sections, and learn about different organelles in this highly interactive site. Digital Anatomist Interactive Atlas (Neuroanatomy): This is an advanced program provided by the University of Washington that can be taken for credit, used in a classroom, or enjoyed for individual learning purposes. Graphics and photos illuminate many components of the nervous system. Online movies are available for every subject. The overview details how to customize the program, label photos and diagrams, navigate the site, and how to use quiz mode. Neuroscience for Kids--This home page has been created for all students and teachers who would like to learn more about the nervous system. Enjoy the activities and experiments on your way to learning more about the brain and spinal cord. This includes a scavenger hunt to help familiarize students with the site and nervous system. A Multidisciplinary Center at the University of Washington, whose mission is to support and facilitate research and research dissemination in the field of alcohol and drug abuse. There is information about research being conducted and local clinical trials; in addition, there is an extensive list of links related to drug and alcohol abuse, treatment, and recovery. Access Excellence is a great site for health and science teachers originally developed by Genetech. Action Bioscience provides readings and curriculum ideas for topics such as biotechnology, the human genome, and a variety of other topics in biology. The Biology Project provides activities, lesson plans, and tutorials, especially strong on problem sets, and tutorials. The DNA Files--Experts and public radio watchdogs explore cutting edge topics in biomedical research. The Genetics Science Learning Center (GSLC)--The GSLC partnership between scientists and educators produces innovative and effective genetic science learning programs utilizing information from leading-edge research. The bookshelf is growing number of biology reference boks that can be searched directly. Several important biology reference texts, such as" Molecular Biology of the Cell" by Alberts et. al, and "Immunology" by Janeway et. al, are available.